Professor Hegna's primary field is theoretical plasma physics with an emphasis on the area of plasma confinement using magnetic fields. These studies employ analytic and computational techniques to study plasma dynamics and are closely coupled with experimental observations. The ultimate goal of the magnetic confinement community is to develop magnetic fusion as a commercial source of electricity. Hegna's current research includes the areas of magnetohydrodynamic equilibrium and stability, transport properties of plasmas, and general magnetic confinement theory. In particular, he is interested in developing theoretical models to understand the role of macroscopic instabilities in high temperature plasmas; nonideal and nonlinear magnetohydrodynamic instabilities; kinetic theory modifications to fluid-like descriptions of plasmas; plasma dynamics in non-symmetric magnetic confinement systems; the role of magnetic geometry, symmetry and topology on plasma instabilities, turbulence and transport properties; self-organization properties of plasmas; anomalous current and momentum transport; magnetic reconnection in laboratory and astrophysical plasmas; and dynamo processes in plasmas. 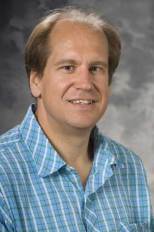 Hegna is the director of the Center for Plasma Theory and Computation and is involved in the research activities of the University's three magnetic confinement experiments, the Pegasus Toroidal Experiment, the HSX Plasma Laboratory and the Madison Symmetric Torus (MST). Additionally, he is heavily involved in the U. S. fusion science program by serving on a number of workshop and conference organization committees, review panels and program advisory committees.